Data centres need high quality and reliable cabling that can be installed very quickly. Pre-terminated cabling are ideal for data centres. They provide a plug-and-play solution for links between switches, servers, patch panels, and zone distribution areas in the data center. These solutions include a variety of trunk cables, array cables, and plug-and-play cassettes that give data center managers choices to suit specific needs. The pre-engineered, factory-terminated and tested trunk cables connect central patch locations to zones or “pods”. 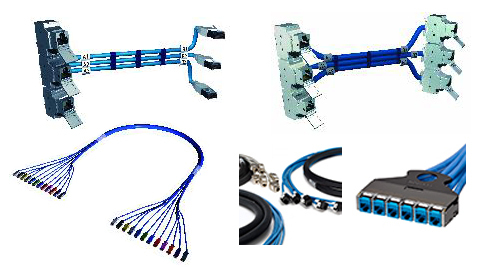 The trunk cables are available terminated with both MTP and discrete connectors, and they are custom-built in any length to meet specific applications. Pre-terminated cabling requires additional upfront planning and a detailed analysis to establish the cabling and termination routes and lengths needed.